A parliamentary report of 1777 recorded a parish workhouse in operation at Lamberhurst with accommodation for up to 24 inmates. 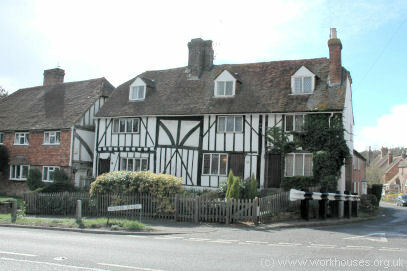 This was probably the building on School Hill, now a house row, which dates from the 15th century. Lamberhurst former parish workhouse, 2005. Sussex: Bodiham, Burwash (2), Etchingham, Frant (3), Lamberhurst (2), Salehurst (3), Ticehurst (3), Wadhurst (3). The population falling within the Union at the 1831 census had been 13,347 with parishes ranging in size from Bodiham (population 349) to Ticehurst itself (2,314). The average annual poor-rate expenditure for the period 1833-35 had been £10,915 or 16s.4d. per head of the population. The new Ticehurst Union workhouse was erected in 1835 using one of Sampson Kempthorne's standard hexagonal plans, similar to his designs at Bradfield and Abingdon. The Poor Law Commissioners approved an expenditure of £4,700 for construction of the building which was to accommodate 300 inmates. Situated on Union Street, a mile and a half to the north-east of Ticehurst, the site location and layout can be seen on the 1875 map below. 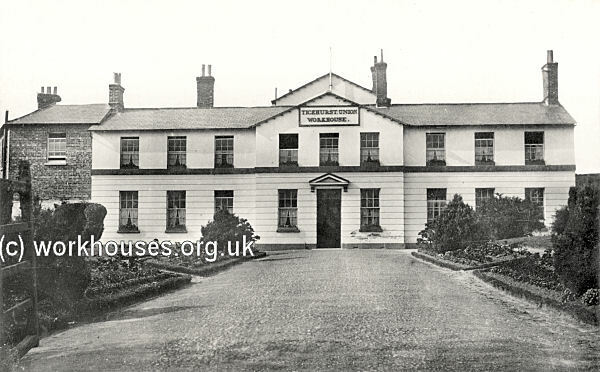 Ticehurst workhouse from the south, early 1900s. Infectious wards were added in 1885 and an iron chapel was erected at the south of the workhouse. 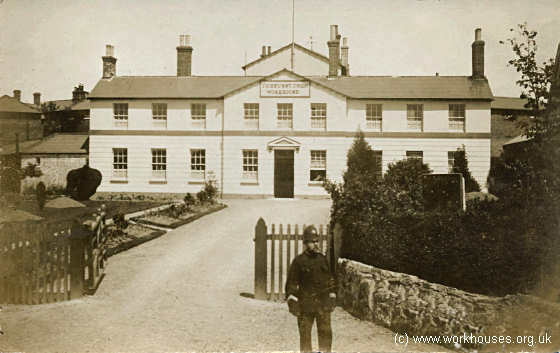 After 1930, the workhouse was taken over by East Sussex County Council as a Public Assistance Institution. It later became known as Furze House. The buildings have now been demolished to make way for a housing estate. East Sussex Record Office, The Keep, Woollards Way, Brighton, BN1 9BP. Holdings include Guardians' minutes (1839-1930); Births (1852-1930); Deaths (1852-1930); Admissions and discharges (1886-1930); Out-relief records (1848-1930); etc.